SAP Integrated Business Planning is a world-class solution for supply chain monitoring, sales and operations planning, demand management, inventory planning, supply planning, and response management. These IBP applications have been developed to deliver analysis and share real-time information alerts across an end-to-end supply and demand network, with the speed of the SAP HANA platform and fast adoption through SAP Cloud. It also offers a collaborative environment for sales and operations planning across global functions, new optimization algorithms, and supply chain monitoring capabilities. S&OP process is the core of Integrated Business Planning process. This process aligns demand and supply to drive a business outcome. The SAP Integrated Business Planning solution for Sales & Operations helps you engage key stakeholders in an efficient, integrated planning process that profitably aligns demand and supply. The IBP Sales & Operation Planning (S&OP) solution provides a unified model of demand, supply chain, and financial data for real-time analysis and simulation. SAP HANA based Integrated Platform: IBP S&OP enables a complete enterprise model, which spans commercial, operations, and finance functions to model demand, supply, and finance constraints and targets simultaneously. The model is easy to reconfigure and is based on SAP HANA, which provides scalability and the ability to handle large data volumes and calculations. Intuitive UIs via Web, Microsoft Excel, and Mobile support, which are quick, accessible, have real-time visibility, and flexible planning. It is a flexible model that provides easy access using the analytic capabilities of Microsoft Excel. Scenario planning and comparison with multiple plans is possible in real-time at both a detailed and an aggregate level due to SAP HANA. SAP also offers what-if simulation capability, which is available to a planner at any time and across the entire model. SAP HANA provides a dramatically faster in-memory computing platform than any other on the market. SAP JAM based Collaboration: Social collaboration is embedded throughout the application, which allows you to engage with business functions and to have transparent information sharing and decision making during the Integrated Business Planning process. Enterprises can use this solution to deliver a cross-departmental S&OP balancing that impacts enterprise inventory, service levels, and profitability positively. Creates the optimal business plan to drive revenue growth and increase market share. Effectively balances demand and supply, and attain financial targets. Increases speed and agility of planning and drive the most profitable responses. Improves forecast accuracy and on-time delivery. SAP Integrated Business Planning for Demand enables short, mid, and long-term forecasting. You can get full demand transparency for short, mid, and long-term forecasting by leveraging demand sensing and statistical forecasting methods. Develop accurate mid-term statistical forecasts. Traditional mid-term forecasting relies heavily on statistical methods, but also on collaboration and business input. IBP Demand works in conjunction with SAP IBP for Sales & Operations to allow Demand Planners to generate a consensus forecast at any level. Manage multiple demand signals. Collaborate for accurate forecasting. SAP Integrated Business Planning for demand provides robust statistical models for an initial forecast, but it also includes collaborative tools that collect information about a demand. You can use multiple demand signals, for example, Point of Sale (POS) data, distributor withdrawals, and orders or shipments to drive a short-term forecast. React faster to short-term demand changes with pattern recognition based algorithms used in Demand Sensing. In the short-term, SAP Integrated Business Planning for demand uses state-of-the-art pattern recognition algorithms to react to changes in demand. SAP strives to make demand planners efficient and more business focused, instead of just operating as statisticians. Demand Sensing helps provide accurate deployment of product based on short-term demand. Short-term forecasting enables a more accurate deployment of products, as well as changes to production if a company has an agile production process. SAP Integrated Business Planning for Inventory can be used to optimize multi-stage inventory targets to meet or exceed customer service levels, while considering uncertainties like forecast errors and supply uncertainty. SAP Integrated Business Planning for Inventory allows you to deal with supply chain uncertainty in planning. It sets inventory targets across complex supply chains so that an inventory is most efficiently deployed. SAP Integrated Business Planning for Inventory uses different methods than traditional planning systems. It combines these new methods with true multi-stage (multi-echelon) inventory optimization and full detection and consideration of multiple demand and supply uncertainties. SAP Integrated Business Planning for Inventory also provides process consistency in inventory planning, and better visibility to the root cause of inventory through embedded analytics and the what-if simulation capability. SAP Integrated Business Planning for supply allows you to create advanced supply planning simulations for S&OP based on forecasts, orders, and inventory or safety stock targets. IBP for Supply & Response can be used as an extension of the higher level IBP S&OP process. It can also provide a constrained demand plan as an output for further supply processing in other planning systems, such as, SAP Advanced Planning and Optimization APO, or SAP ERP solution: S/4 HANA (SAP's Business Suite for HANA, which is SAP's fourth generation ERP solution) or SAP ECC (SAP Enterprise Central Component, which is SAP's third generation ERP solution). Simulate constrained or unconstrained production and distribution plans using heuristics or optimization based algorithms. Determine distribution and Bills of Material (BOM) using multi-level sourcing. 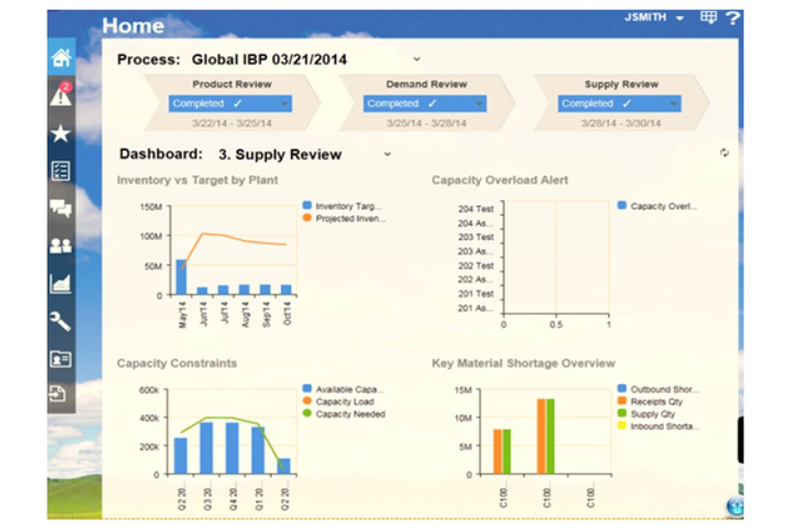 Develop a rough-cut capacity plan in a times series bucketed supply plan. Simulate capabilities for scenario planning. Provide a constrained demand plan as an output for further supply processing in another planning system like SAP Advanced Planning & Optimization APO or SAP Enterprise Central Component ECC. IBP Supply & Response displays supply requirements and plans across the supply network locations and through levels of the Bill of Material (BOM). The SAP Supply Chain Control Tower is a supply chain visibility solution that bridges the gap between supply chain planning and execution domains through real-time supply chain monitoring. 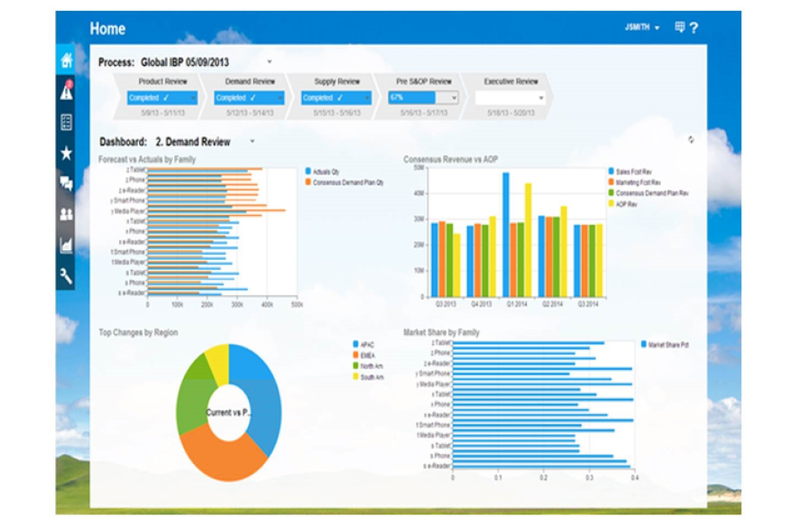 SAP IBP Supply Chain Control Tower allows true end-to-end visibility from suppliers to customers. Planners can monitor production as well as ongoing transportation and handling activities, for example, a shipment, at a granular level. Smart alerts: Deviations are analyzed and related to the end customer. Smart alerts provide information and suggestions in consumable context. Analytics: Supply chain and financial metrics, for example, the expected cost of lost sales, are calculated in the alert context and provide significant guidance on what area to focus on. Internal and external information is provided from planning and execution systems in one view, close to real-time. Increased On-Time Delivery Performance to Customer. Focus on the customer by aligning operations towards high customer service. Shortages are related to customer demands and a high degree of visibility is established. Decreased Overall Inventory Levels While Reducing Risk. View current stock in one system, as opposed to many different systems that have data, which is not synced.